Fraud prevention, established 1275. Indeed, fraud has officially been a major stumbling block to our collective peace of mind since the 13th century and it was the British who first marked deceit as a punishable crime by drafting the Fraud Act. Fast forward to 2018, despite our over-700-years-long combat, the offence has become a gargantuan phenomenon that mounts ever more valuable trophies. It was around the beginnings of this decade - once ecommerce emerged - when we saw it turn into a digital parasite that started devouring businesses around the world. This, in turn, spurred the necessity of employing new, relevant fraud detection techniques. In continuous efforts to safeguard their companies’ wellbeing, managers and directors have employed various fraud prevention solutions since the inception of online transactions. Despite these efforts, merchants are challenged on various fronts and are constantly taken off guard by fraudsters who are tapping into more and more sophisticated strategies. Wary of the widespread threat, they prioritize fraud mitigation more than ever. I have noticed, however, that their attention is somewhat diverted from what truly counts in this regard. In my note, therefore, I’d like to discuss the so-called fraud rates - the red herring of fraud prevention. There are four phrases that come in handy while discussing fraud. Given the focus on cost cutting, it’s fraud rates that get the most attention since they directly translate into financial losses. In order to preserve their companies’ bottom lines and prevent theft attempts, the decision makers of the biggest industrial players decide to preemptively block a large chunk of transactions. Their reasoning may seem logical - it’s all aimed at preserving the company’s financial health, but in reality, as a result of increased security measures, they lock out their loyal customers. 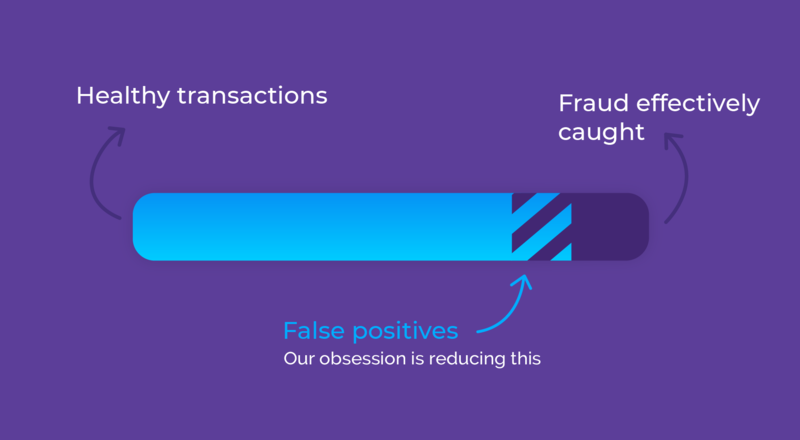 And while the totality of fraud may seem like a hefty price to pay and needs to be prevented at all costs, the actual cost of false positives amounts to so much more! The problem of false positives is in fact even bigger than fraud itself! Speaking of the numbers, Javelin Strategy & Research revealed that out of $118 billion in lost sales for merchants in the US in 2015, while fraud only accounted for $9 billion. Furthermore, in 2017, the fear of fraud led merchants to reject 2.6% of all orders, 3.1% of which were worth more than $100. Are such great numbers capable of jeopardizing the company’s financial stability? Ecommerce has been growing incredibly fast for the last 10 years - to be more precise - by 109% since 2010 in the US only). This has allowed fraud prevention teams to keep the denial rates high and still have the overall business continue to grow aggressively. Fortunately, losing money over fraud is no longer an essential part of doing business these days! Actually, it is something that modern fraud prevention systems are particularly good at. For example, Nethone has been able to decrease denial rates by more than 20% while keeping fraud rates at the same level or even lower and cutting the manual review by over 60% on average. How? Today, fraud is typically being identified and stopped with the aid of static rules based on a set of roughly 35 variables. The rules usually combine a set of 3 to 5 of these variables to segment a piece of traffic and block it, for example, all IP addresses coming from X, with an email address with Y domain, with a flight leaving in less than 2 hours. Machine learning takes a different approach. Leveraging all the data at your disposal, a bespoke engine attributes weights for all variables when explaining one phenomenon - fraud. To put it in very simple terms, the machine learning engine takes into account ALL the variables it has garnered and blocks fraudulent transactions. This approach gives recommendations which are much more precise. Nethone provides not only the engines, but also complements the 35-40 variables a business has with over 5 000 other variables gathered by our proprietary profiler. Such a combination guarantees extremely precise models, capable of identifying a needle in a haystack. Is it worth breaking out of the one-track mind that only ever sees fraud rates? Absolutely yes! Imagine if your business could increase its revenue by 1% or more without increasing either operational or fraud related costs. All it really takes is to take a holistic view on all of the transactions. Furthermore, you need to remember that if you reject your loyal customers suspecting their bad intentions, they won’t be looking for your forgiveness in perpetuity. They’ll simply choose to do business with your competition. Shore up your security wisely - block fraud, not your customers! Rodrigo is a strategy-oriented professional, consultant and facilitator with a wealth of experience in organisational development and international practices. He holds a Bachelor's degree in Economics obtained at Panthéon Assas - Près la Sorbonne and an MSc in Strategy earned at HEC Paris. Prior to joining Nethone, he held Account Management and Brand Manager roles at L’Oreal. As a native-level speaker of French, Spanish and English, he is passionate about languages, culture, religion and philosophy. At Nethone, Rodrigo is in charge of developing the company’s commercial strategy as well as identifying and seizing business opportunities to sustain Nethone’s rapid growth.